Easy, peasy – but elegant and pleasing too, as we’re sure you will find if you make a few doily wrapped ornaments for Christmas. 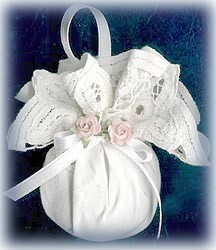 If you like this craft, you may also like to see our Victorian Doily Light Bulb or Doily Christmas Tree. For these ornaments you can use a glass ornament, styrofoam ball or pretty much anything which is round, fairly lightweight, and can be hung from a narrow ribbon. Just wrap your doily around your ornament and tie with the ribbon to secure. Use a little hot glue to attach a few tiny flowers, pine cones, Christmas greenery or other embellishments.